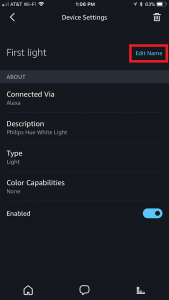 If you’ve got the Echo Plus, you might be wondering how to connect the Hue light bulb that came with it. Because the Echo Plus has a built in ZigBee hub, its super easy. The fist step is to just screw the bub in and turn it on as you would any other bulb. 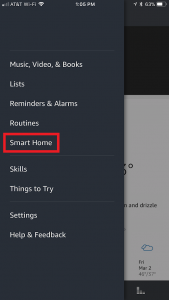 Open the Alexa App and Click the Menu Icon at the top left corner then Select “Smart Home” from the menu. You’ll be taken to the “Devices” Tab. 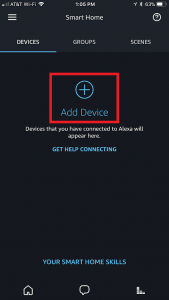 Click “Add Device” and Alexa will start searching. 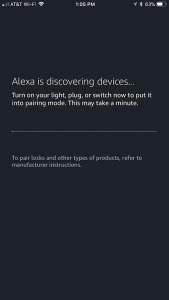 You will be brought back to the Devices tab and see the Alexa has discovered your First Light and named it as such. 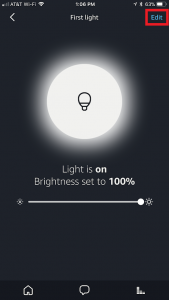 At this point you can tell Alexa to turn on or off “First Light”. Go ahead, try it. Next Click on “First Device”. You’ll be brought to this screen where you can play with the dimming. 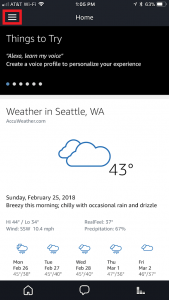 You can adjust the levels up and down with your finger, or simply ask Alexa to do it for you. Click on “edit” so we can give your lamp a more appropriate name. Click “Edit Name“, give your new light a new name, click “done” and use the back arrow to get back to the Devices tab when you are done. At this point, your Lamp is set up with the name you’ve chosen and you can control it by asking Alexa to turn it on by name. Here’s where it gets interesting. Let’s say you don’t want to tell Alexa which light to turn on and just want to say “Alexa, turn on the lights”? You can do this by creating a group. 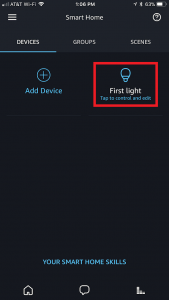 You can put multiple smart bulbs, smart switches, and smart outlets in to a single group such as “Living Room” and if you add your Alexa to that group, it will know when you say, “Alexa, turn on the lights” that you mean the lights in its own group. If you buy additional Echos to put through the house, when you say “Alexa, turn on the lights”, the closest Alexa to you will know to turn on the lights in its group! You will then be put in the “Define Group” screen. Her you can select the devices you want in this particular group. Select your lamp and your Alexa and Save. 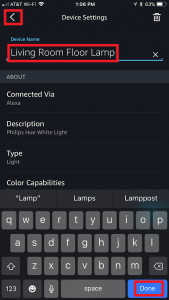 Now you can Tell the Alexa to turn on, off, or dim the lights without specifying which room because the Alexa knows to turn on the lights in its group. This gets fun when you have multiple Echos and multiple groups. Try “Alexa, dim the lights to twenty percent“.